DOES ANYTHING EVER REALLY CHANGE? A grandmother sent me the below article in quotation marks and I would predicate my response in saying a healing that cannot take place in full measure without radical changes in governmental policies directed at the nations. These are difficult things for all concerned to discuss and as is my way I will not personalize with the names of those close to me as a matter of respect and the understanding this is the internet and it is their choice whether to or not. So I speak in generic terms of a grandmother, a grandfather, the “gatherers”, or little ones. It requires an effort for me not to become angry in seeing how such things impact others, the memories always just below the surface that can be triggered in ways not understood by those who are not of the nations or share the experience. What needs to be understood is that after five plus centuries of war and oppression we as a people cannot nor should we ever forget, nor should our children when they have reached an age of understanding. There’s is no half hearted conservative contested apology hidden away in unrelated legislation, no rhetoric nor monetary “compensation” that suffices – wherever you see land that is red it is the red of the blood of our ancestors who fought and died that covers this land. It is the red seen in sunsets, and the paint we put on for pow wow, a living reminder of the blood shed and the blood that courses through our veins, reminders that we are truly nations of “red” men and women and damn proud of it. Entire nations of our people have been eradicated yet we remain and we’re not going anywhere. Genocidal policies can neither be revised or swept under the rug as long as so much as one of us of any nation yet lives. ‘Army begins unearthing remains of children who died at Carlisle Indian school. August 8, 2017: Nelson White Eagle, gray and stiff at 78, needed time to make his way across the wet grass to the graves of the children, but when he got there, he didn’t hesitate: The Northern Arapaho elder sang — a song of gratitude and honor, of thanks and remembrance and healing. No answer came from the rows of white headstones in the cemetery on the grounds of the former Carlisle Indian Industrial School, now the campus of the Army War College. And none was expected. He arrived on the grounds Monday, joined by about 15 other tribe members, come from Wyoming on a mission both sacred and sorrowful: to reclaim the remains of three Northern Arapaho children who died at the school, and who lie among nearly 200 native students lost in a brutal, turn-of-the-century experiment in forced assimilation. Shortly after 8:45 a.m. Tuesday, after private native prayers and ceremonies, an Army team put the first shovel to the earth, beginning what’s expected to be a five-day process of exhuming the three boys. They’re to be reburied next week in their rugged mountain home, the Wind River Reservation. The aim of the nation’s first federal off-reservation boarding school, founded in 1879 by former cavalry officer Richard Henry Pratt, was to rid natives of their “savage nature” by erasing their names, languages, customs, religions, and family ties. Braids were cut off, and boys were put into military-style uniforms. Beatings were common punishments, and epidemics proved deadly. Even as children succumbed to tuberculosis and flu, Carlisle became the model for dozens of Indian schools that spread across the United States and Canada. Little Chief, the eldest son of Chief Sharp Nose, arrived at Carlisle on March 11, 1881, a boy of 14 accompanied by two young friends, Horse, 11, and Little Plume, 9. Within two years, all three were dead. “It’s going to be very emotional for us,” said Yufna Soldier Wolf, a great-niece of Little Chief’s and leader in the push to return him and his compatriots to their tribe. Family members of Horse and Little Plume were there, too, some stunned to silence by the enormity of a cemetery full of native children. To them, and to many native peoples, Carlisle is not simply a small town in central Pennsylvania — it’s the place where the federal government set out to destroy their way of life, and where their children died in the process. By mid-afternoon on Tuesday, the day had turned hot and steamy as sweating Army staff pressed on with their digging – under the watchful gaze of the Northern Arapaho, who rarely strayed far from the cemetery. The first child had yet to be exhumed, but Army officials said plans remained on schedule. Several tribal elders, some on canes, returned to their hotel for rest, while young people embarked on a tour of the grounds, learning about a place they knew from tribal lore but had never seen in person. The Rosebud Sioux in South Dakota say they want children returned from Carlisle, and so have native families in Alaska. The day was historic for all those across Indian Country who want the tragedy of the boarding-school era to at last be aired fully and publicly. Some researchers say the collective damage inflicted on children at boarding schools has contributed to the addictions and dysfunctions that plague many tribes today. Like other students at Carlisle, the three Northern Arapaho boys were forced to accept new English names. Little Chief became Dickens Nor. Horse was renamed Horace Washington, and Little Plume was called Hayes Vanderbilt Friday. Little Plume, buried under a headstone marked “Hayes, Son of Friday,” was to be exhumed first, from his resting place near the center of the cemetery. Army officials outlined the process for each grave: The 240-pound headstone would be removed. Then the grave would be opened, a job undertaken with shovels, trowels, and hands — no machinery. The dirt from the grave was to be sifted through a series of mesh screens, to capture cloth, shirt buttons, jewelry, coffin pieces, and small bits of bone. Bones and teeth will be examined by Elizabeth DiGangi, a forensic anthropologist at Binghamton University and an Army consultant, to determine whether the remains are the correct gender and age. DNA testing will not be undertaken. The remains will be kept in an on-site vault until the disinterment is complete. At that point, control of the children will be transferred to the tribe. On Monday evening, members of a native group called Circle Legacy, who for decades have washed and cleaned the headstones here, put on a potluck dinner for the Northern Arapaho. Elders leaned on the arms of helpers, while children — young, native children — once again roamed the grounds of Carlisle, laughing and chasing one another. The Carlisle Indian Industrial School was founded in October 1879 by U.S. Army Officer, Lt. Richard Henry Pratt. It was the first U.S. government off-reservation school to enroll students from virtually every Native American Indian nation from the various agencies and reservations. Beginning with an enrollment of 82 children from the Rosebud and Pine Ridge Sioux communities, numbers swelled to as many as 1,000 children annually during the period from 1879-1918, when the school closed. Designed to offer academic and industrial training the program enrolled over 10,000 American Indian children. The experiment was designed to assimilate students into the mainstream culture and was housed in Carlisle, PA at the Carlisle Barracks, now the home of the U.S. Army War College. “Carlisle” became the model for 24 off reservation schools with the purpose of acculturation. Many of the school buildings are still standing. The site is designated as a National Historic Landmark. Guided tours are occasionally offered by the Cumberland County Historical Society where a self-guided walking tour brochure may also be purchased. Visit the Cumberland County Historical Society’s Carlisle Indian School exhibit. In some instances it is unwarranted for a person to say they are owed something-in others it is undeniable. But often enough the individual has to make their own opportunities, that can be a difficult task at times. This blog in a manner of speaking has been an opportunity for me, an opportunity to broaden my understanding and use of language. I still struggle with it at times, do the spell check and avail myself of online dictionaries seeking definitions, but I’m getting there. And that punctuation thing still has me confused. Kind of a penchant of mine to look for origins, the genesis of things, how I or a person may have arrived at the position they have. How and why an event transpired. In my case it began with an elderly couple who had been educators giving me a box of books when I was a kid and comparing them to keys that could open doors. As a child and being somewhat feral my interests lay elsewhere, interests like running through the woods, hanging with my grandfather, getting distracted by something real or imagined, or making a little money to help at home. Work liberated me from school prior to finishing junior high, I was pleased with that, but something I’ve come to understand had it’s downside too. In the transitional years I drank a little and fought a lot, much to the dismay of my mother who had enough experience with that related to my father. Neither ever got in the way of or effected my desire to work, or my enjoyment of it. Fortunately the light went on and I gave all the ignorance up. I credit my mother, my “second mother” and a few others with that. …and books. Also a growing awareness that those things contained within the pages of books were indeed keys-keys that could equip the reader and make a difference. Keys that were essential to understand history and all that had transpired in the form of treaties, laws, manipulations, intent, and legislation that brought our people to the point we are at. It’s easy to say something is wrong, but more meaningful if you can chapter and verse the reasons why and rebut arguments and excuses. As a demographic more of our young people enlist in the military than any other group percentage wise, there may be a great irony in that but opportunity is the primary motivation. A steady income, benefits, education, and the opportunity to learn a trade- if those assets were available within our own communities I have no doubt enlistment numbers would decline and silence the naysayers who overlook the realities that often lead to it. We still view this country as our land, and should understand that it’s enemies whether we had a hand in creating them or not will not discriminate when it comes to us- those of our own will fight to protect their families, their loved ones, and their land just as any other will-that too plays a role in enlistment-showing some respect for that would be a good thing. If it had not of been for the code talkers we might all be eating a different diet and speaking a foreign language other than English, that’s something to think about. Education is a key our children and every child need and can rightfully say is their due, so is healthcare, opportunity, and a level playing field. Education that doesn’t seek to convert or assimilate, to transform them into another brick in the wall-rather one than strengthens their heritage and equips them for life- a focus gathering momentum on every rez in this country, a focus that can and will create opportunity. We don’t need to be a product of the system’s schools anymore than we did the boarding schools. We need an integrated approach that combines the best of both and allows our children to be grounded in OUR history and traditions while at the same time equipping them to succeed in a world not of our making. The modern reality is that if you are lacking education or a marketable skill you haven’t much of chance. We either move forward or remain static and dependent-locked in a rictus of poverty….there are no other choices. It ain’t easy being us today, and the difficulties all began with the first landing of the Euro boat people, but the onus is on us to address and mitigate circumstances or do little and talk about what we are owed…..talk if restricted to nothing more than that has and will continue to embed a generational dependency into the fabric of the nations. I have always enjoyed reading, though when I was younger I struggled at times with certain words and their context. A person might think that would have led to liking school but I didn’t – I thought of it as restrictive as I always wanted to be outdoors. There were favored haunts in the woods where I would sit and read, maybe next to a stream, leaning against a tree, or even sitting in one – a model I would like to see schools take for children, for them to be outdoors as much as possible – to learn not just from books but all that surrounds them. Every nation in this entire hemisphere has experienced a “trail of tears”, some to the point of extinction. Languages and entire belief systems and customs have been lost or incrementally assimilated, and not as the result of a naturally occurring event. Some trails may seem more brutal than others, capture the public’s attention, but the common thread of misery and suffering was not and is not diminished for the survivors, nor the brutality – the same loss of loved ones, the same misery and suffering, the same devastation and impact measured in blood and tears. As a people we didn’t lose a job or a home, we lost everything, and yet to regain any realistic or equitable measure of it. In this “land of the free” we weren’t even allowed to practice our ceremonial beliefs – nor allowed to keep our children or instruct them in our ways. Our children, who were shipped off to boarding schools, punished for speaking their own language, shorn like sheep, and adopted or placed in foster homes by the thousands. We could join the military, risk and lose lives and yet not be considered “equal” enough to vote until nearly the mid point of the twentieth century. No genocidal effort of conquest has ever taken place anywhere on an entire hemisphere that compares in scale to what took place here. We have been characterized as governmental “wards”, enemy combatants, uncivilized, and somehow a lesser people – but I say in view of the history if the term uncivilized is to be applied to anyone it cannot rightfully be applied to us with clear conscience. Now it seems as though we are expected to put it all behind us, to “get over it” as some have told us – I doubt as long as the history and memories exist that is possible. Maybe in time if the present conditions moderate we will arrive at a point when we are able to compartmentalize the past and what will become the past, but one thing we must never do is forget, for as said in the “On This Day” blog, having been introduced to the blood and savagery of the age of steel we may never be the same. Ran across this on Annie’s fb page and think it should be displayed in as many sites as possible. The intent isn’t to minimize events such as Sandy Hook, Columbine, or anywhere else but merely to add another perspective- one that speaks to a genocidal mindset directed at indigenous people and perpetrated by the government. Modern day shooters such as those at Sandy Hook and Columbine have a twisted agenda that may never be understood-usually loners with a history of bizarre behavior-and while the governments deeds and approach to the “Indian problem” certainly can be characterized among other things as bizarre it has been a matter of policy and likewise qualifies as a murderous rampage. At some point a shift in policy took effect, or perhaps merely an expansion that became known as the reservation system which exists to this day not only within the continental boundaries of the U.S. but elsewhere in such diverse locations as Gitmo. That may seem a broad statement to some but if they consider that eighty plus prisoners still being held there have been “cleared” and yet remain confined the comparison becomes obvious and valid when you consider many of our people have likewise committed no crimes. These prisoners may be viewed as “potential” terrorists, not for anything they’ve actually done but as a result of their unlawful detention- I think such was and may be the case with the reservation system and indigenous people in general. We have been systematically stripped of our birthright, killed, and confined, and at least historically viewed as a potential threat that had to be contained. An example of this is illustrated by the treatment of Apache “scouts” who in effect joined the military to assist in campaigns against their own people and then found themselves being shipped off to Florida following it’s conclusion. Our people have fought in every war this nation has been involved in-yet were effectively denied the right to vote until the middle of the twentieth century. Immigration reform is a current political topic, one no doubt driven in part by demographics being viewed as voting blocs- it is on the surface at least an attempt to integrate those who in one sense of the word are disenfranchised and allow them a level playing field- an act of assimilation. 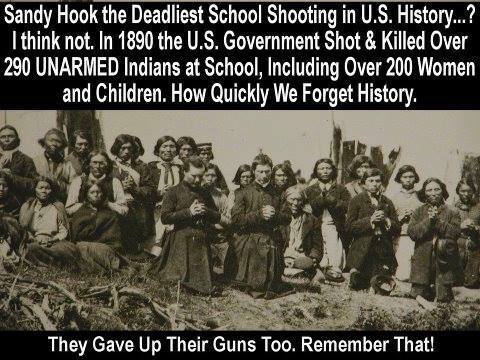 The reservation system, boarding schools, and the outlawing of various ceremonies have also been an attempt to assimilate by brute force and at the point of gun. Well and good to honor code talkers, to issue apologies, and stage photo op meetings, but in the midst of this the slaughter that occurred of our children is not be forgotten. It isn’t a case of that was then and this is now. It just isn’t going to end as the almost daily revelations continue-this unfettered beast that is the Catholic Church has wreaked absolute havoc in every corner of the globe where it has set foot-from slavery, torture, executions, war, the theft of children, rampant sexual abuse, collusion with the Nazi’s and their involvement in assisting escapes to South America, you name it-nothing so hideous they wouldn’t partake of it. Always with some bloated pampered “spokesman'” said to be wearing the shoes of the fisherman, or maybe it’s Dorothy’s red slippers, sitting upon the throne in absolute opulence, and cradle to the grave believers making excuses, apologies, and inane defenses. It is inexplicable to me that after centuries of well know abuses any among our own would count themselves among the faithful. As illustrative an example of acculturation as has ever been seen. There should be no place for this “church” on the rez or in any of our lives, and they should be told to leave-centuries later and they are still attempting to co opt the nations. What peace or salvation is to be found built upon the bones and blood of our own? By what metric will any of us measure the value of a thing? If on the other hand all that is required is some bogus Vatican apology how is that the same standard isn’t applied to “official” governmental ones? Can it be that words, an apology, can never atone for a rabidly brutal past? So while some will defend and accept the words that emanate from the belly of the beast that is Rome how is it they won’t, and with just cause, entertain a governmental apology? What a convoluted and unreasoned approach. Does saying sorry, my bad, make amends for a single child murdered, tortured, or sexually abused at the boarding schools or one of their “churches”? Does saying that was then this is now when then and now are interchangeable make a difference? If a little money is thrown around does that make it alright? If Creator has a place for you in the afterlife no person, no entity usurps that-no one has the authority, the power, to excommunicate another, much less an evil empire covered in the blood of the innocents and wallowing in it’s riches. A culture cannot survive without it’s language and traditions-to accept the language of the Missal and the traditions of this merchant of greed and abuse contributes nothing to the survival of the nations, it only facilitates the demise-and that has always been the goal. This so called church has nothing to offer but hypocrisy and a crafted fear mongering that creates purgatories, the threat of excommunication, and a belief that one must sit in a box “confessing” to seek absolution. The Creator is accessible-no brokered deal requiring a middle man is necessary-and he sure as hell isn’t asking any for their money or to bow and kiss a ring-we don’t bow to any man, neither do we kiss rings or asses.